The more the time we are living through seems out of joint, the harder it has been for the theatre, which in the past was often looked upon as „the“ political art, to find its footing. Either theatre doubts its own social relevance, or it delegates this relevance to specific political, but not necessarily artistic, action. Or then again it resorts to old aesthetic devices that are essentially restricted to frontal, critical presentations of grievances, but finds no proper (that is, itself political) form for this strategy. Yet there exists again, after a period of mainly narrative theatre in the 1970s and 80s, followed by post-dramatic forms that focused on the medium and its aesthetics themselves, a strong desire for political theatre. A theatre that finds not only access to important social issues, but is itself a political space and public sphere. Yet there is no longer a common short organum for the theatre (Bertolt Brecht, 1948) that we could follow. We find ourselves in a period of experimentation, of searching – on the part of both artists and audience. There are, however, plenty of artistic approaches that make clear again the potential of political theatre. Participation is a word that seems to have become well-nigh useless in our all-inclusive capitalism. A sedative, which, as side-effect, delegates the responsibility for what happens to the citizen, who is impotent to influence the outcome of events. The same applies to much of so-called participatory theatre, which all too often is only an imitation of such placebo participation and forces the audience to engage in a predictable set-up in which all options have been prescribed. Passivity disguised as activity. But as problematic as the concept has become, we still very much need a theatre of participation that enters into the midst of this dilemma: not only in order to avoid false participation, but also at the same time to re-appropriate the idea of genuine participation. A participation that can unfold its radical potential – in politics as in art. Real participation – this means relinquishing responsibility and power. Bertolt Brecht’s learning plays (Lehrstücke) were intended to be performed by the audience themselves, the working class. The Brazilian theatre-maker Augusto Boal pursued this idea in his “theatre of the oppressed”, even handing over the responsibility for how the performance developed to the “spect-actors”, the audience, who became actors during the performance. The Dutch theatre-maker Lotte van den Berg, in her long-term project Building Conversation, goes yet further in the effort to reduce theatre to its essential core. For her, theatre is above all a place of communication, of coming together, an understanding in compliance with often very different rules. Building Conversation is inspired by conversation techniques from around the world. There are no actors, no audience; only the invitation to take part. For example, in a conversation without words, inspired by Intuit assemblies, or an alternation of reflection, retreat and dialogue, as practiced by Jesuits. Other conversations take place entirely without moderation, topic and goal: a procedure developed by the quantum physicist David Bohm in order to reveal patterns of collective thought. 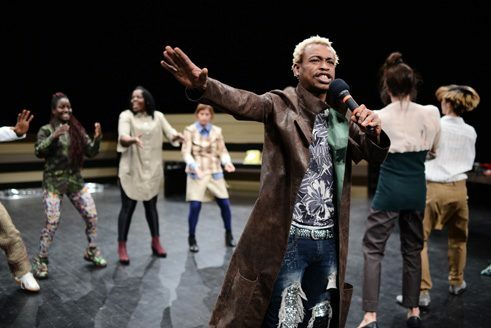 Building Conversation is directly influenced by the Belgian political theorist Chantal Mouffe and her concept of “agonistic pluralism”, which is well suited to describe the specific possibilities of contemporary political theatre. While many philosophers, from Karl Marx to Jürgen Habermas, believe in the possibility of a general social consensus, Mouffe warns against suppressing different opinions by alleged consensus, which would ultimately lead to hostile antagonism. If we want “that people should be free, we must always allow the possibility that conflict emerges and make an arena available in which differences can confront each other”, says Mouffe. For me, the special potential of theatre lies here. In a time when, on the one hand, the dictum “Who is not with us, is against us” is enjoying a remarkable renaissance, and on the other hand a logic of consensus is lulling all democratic discussion to sleep, the theatre can be an arena where we can act out our differences as opponents without having to pacify them. It is no accident that agonism, the democratic acting out of adversary positions without falling into absolute enmity, takes its name from the theatre, from agon, the contest of arguments in Greek tragedy. While some of the work of the Swiss theatre-maker Milo Rau is more indebted to a well-done empathetic realism, his productions of political trials can be interpreted as such agonistic theatre. In the Moscow Trials (2013) three traumatic trials against Russian artists and curators are once again brought before the judge – but this time in the arena of art. Curators, artists and critics fight for artistic freedom; against them are ranged conservative TV presenters, orthodox activists and priests. The Sakharov Centre in Moscow was for three days an agonistic field where radical opinions were exchanged in a manner no longer possible beyond its walls. Where theatre thus becomes a public space, it becomes evident what participation in theatre can signify: participation that, as the art historian Claire Bishop writes, creates more a feeling “of unrest and of discontent than one of belonging”. That all participants are treated as “subjects of independent thinking” is “the essential prerequisite for all political action”. Everyone who comes to the theatre – whether as actor, performer, spect-actor or audience – is always part of a larger community, marked by skin colour, gender, class, body, profession …. The questions that currently beset all democracies – who is represented how, by whom, in what way and by what right – are reflected in the theatre. Can a middle-class actor represent a refugee? Can the West represent the global South? Can a man represent a woman? Does the representation of stereotypes (gender, race and so on) unmask them, or does it only repeat degrading insults? The roots of recent discussions such as the so-called black-face debate go deeper than merely questioning the right and competency of white actors to play black characters. The challenges are complex – politically and artistically. They will outlast current debates about political correctness and occupy the theatre for time to come. Post-dramatic theatre collectives, such as Gob Squad and She She Pop, responded in the 1990s and 2000s to the presumption of wanting to represent without further ado all the problems of the world in the theatre by focusing on their own lives. Others, like Rimini Protokoll, brought representatives of other worlds live and in person on stage. These approaches effectively re-mixed the deck, but in a rapidly changing world their limits too are now becoming visible: they risk looking upon your own living room as the world, or tilting respect for “the Other” into exoticism. Theatre-makers such as Monika Gintersdorfer are therefore always searching for new forms in which they can in fact share the stage with their colleagues – in her case, with African colleagues – by constantly redefining the role of the director. The concept of the Chefferie (chieftainship), a political model of the assembly of many equal chiefs going back to pre-colonial times but still extant today – not only gave one of her works its title, but also serves as a metaphor of cooperation. Theater Hora “Disabled Theater” | © Theater Hora, Photo: Michael Bause By contrast, the Swiss theatre Hora, one of the best known companies of actors with cognitive disabilities, still seems to allow its directors traditional outside positions. At second glance, however, it becomes clear that the resistance of the performers, their own strong, often unpredictable personalities, constantly subverts this working model. As guest director, the French choreographer Jérôme Bel made this position very clear in Disabled Theater (2012): on the one hand, his very strict stage directions were announced clearly during the performance and underlined the hierarchy of the production; on the other hand, the performers went about their tasks as they liked (and sometimes not at all). In the end, it is in theatre as in society: if we really want pluralism, those who are under-represented (or are only represented by others) must play a greater role. On stage as well as behind and before it. Only then can theatre actually be a place where social practices can be tried out and invented on a small scale. In this it helps that theatre not only endures the contradictions of art and politics, but also lives from them. Here everything is always simultaneously representation and presence, real and artificial. Theatre is a paradoxical machine that allows us to observe ourselves from outside while we are still part of the performance. Its situations and practices are at the same time symbolic and actual. Theatre is really political when it makes use of this power. Florian Malzacher is Artistic Director of the Impulse Theatre Festival in Düsseldorf, Cologne and Mülheim/Ruhr, and a freelance curator, dramaturge and writer.